There isn’t a good way to discuss this book without spoiling the previous. If you haven’t read The Dead in Their Vaulted Arches, you may not want to read on. Yaroo, a new Flavia book! I dearly love Flavia de Luce. I read this series to see what sorts of shenanigans Flavia gets into and how she works her way out of them, not because I’m really engaged the mystery. Given the end of the last book, I was nervous about The Chimney Sweepers Come to Dust. What would a Flavia story be like without her father, her sisters, and Dogger? Without Buckshaw? On many counts, Flavia works really well in a different environment (her dramatic insistence that she has been “Banished!” for example or her plotting out how she would poison her chaperone). She’s still getting in and out of trouble, being clever and wonderful, doing chemistry, and making me laugh aloud. The boarding school setting and strange Nide, secret society intrigue were also interesting if a bit over the top. Bradley spends a lot of time building the world of Miss Bodycoate’s. There is a dizzying cast of girls with as many names and nicknames as a Tolstoy novel. Even by the end, they all seemed very similar. I had trouble keeping them apart. My biggest struggle, however, was with the end of the book, which seemed to negate the entire point of the book. 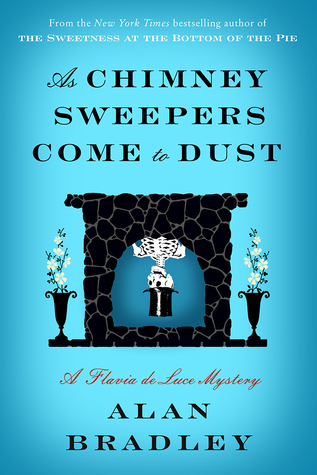 3 stars to As Chimney Sweepers Come to Dust because it’s Flavia and I still enjoy reading about her quite a bit, but this was definitely a weaker entry in the series. I received an advanced copy of As Chimney Sweepers Come to Dust from NetGalley in exchange for an honest review. This entry was posted in Madeleine and tagged 3 stars, alan bradley, Flavia de Luce, madeleine, mystery on February 13, 2015 by Madeleine Book Owl. The Book Owls is a blog devoted to all things books from four book-loving owls from the Midwest. We love our YA books, but branch out into all other genres. Get to know us below! Madeleine roosts, reads, and writes from the Twin Cities. When not reading, she can be found working in a library. Just like Nox's name suggests, when it comes reading, the darker the book the better. A NoDak native, Nox currently roosts in Wyoming. Sonya reads and writes about books from her nest in North Dakota. She can often be found working at the library, reading, watching way too many different TV shows, or cuddling with her ridiculously adorable and badly behaved cat, Leroy. Zelda may be the smallest owl, but her beautiful magenta plumage makes her the brightest. She loves to read YA fiction and is a lifelong Harry Potter fan. The Book Owls is licensed under a Creative Commons Attribution-NonCommercial-ShareAlike 4.0 International License.